In today’s new YouTube vlog we do some large family cooking and make up a huge batch of large family style weekend chili! I love to make a big pot of something on Friday evening that we eat through all weekend long (I mention this tip again in this week’s new large family meal plan). 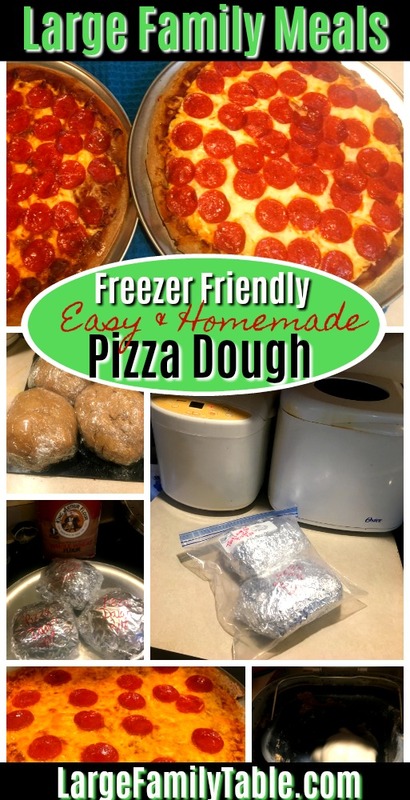 I don’t cook up a big weekend meal every weekend because I often have wonderful large family freezer meals available, but I have used this feeding my family trick since way back before we were a family on the larger side. About 12 years ago in our early homeschooling days, I also worked every weekend as a Charge Nurse in a local long-term care and rehabilitation facility. We were a family of five back then with three children ages 6, 3, and infant. My husband stayed with the little children after his 40-hour work week so I could make the larger nursing wage by working the weekend hours no one else wanted (I worked Friday, Saturday, and Sunday overnight from 7 pm to 7 am). I quickly learned to cook up a big batch of something for my husband and children for the weekend. Even though I no longer work as a nurse, I’m still a working homeschool mom and work on my online business many Saturdays. This method of big weekend cooking has just proved itself helpful again and again, even more so as our family continues to grow. 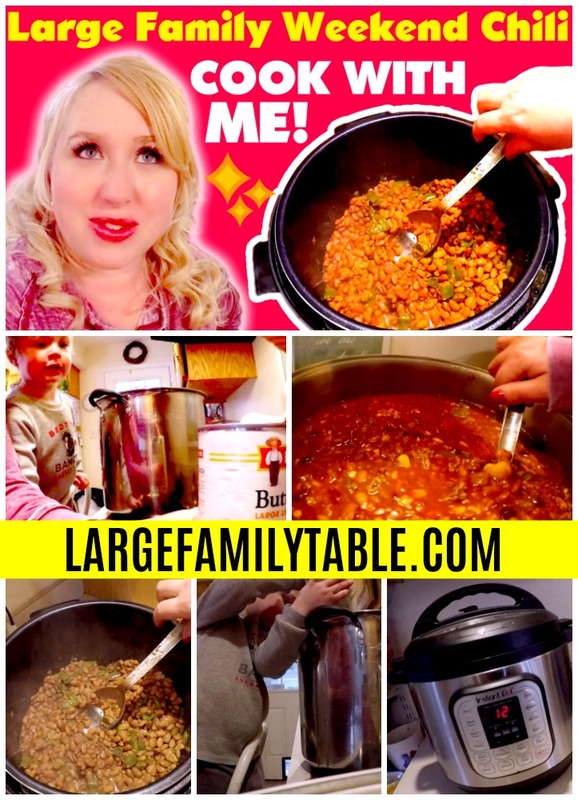 I served this huge 22 qt stock pot of Weekend Chili with homemade cornbread from the freezer! Top your chili with sour cream, shredded cheese, olives, peppers, or *whatever* family favorites!! In a 22-Quart stockpot combined all ingredients listed above. Simmer stock pot on low to medium heat, stirring often. May take 30-minutes or more to be heated through. On the following weekend meal days, I like to reheat portions of this mega chili in the 7-quart slow cooker. Put the desired portion in slow cooker and heat on low for up to 2 hours until warmed to the desired temperature. We also reheat bowls full in the microwave around here. Remember some additional creative ways to eat your chili is to serve chili over noodles or a baked potato! Don’t forget the sour cream and shredded cheese. 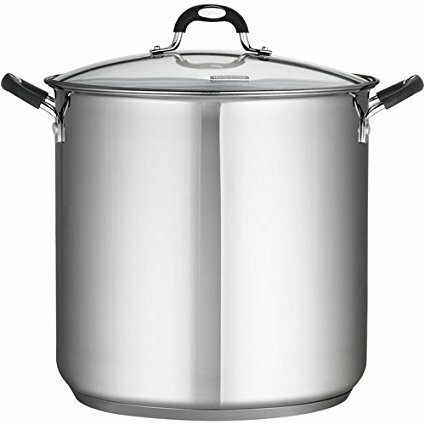 Here’s my Amazon Affiliate link for the exact 22-Quart Stainless Steel Pot I use. Travis found this pot for me at Walmart for about $10 cheaper, but that was a year or so ago. I love it and use it often! 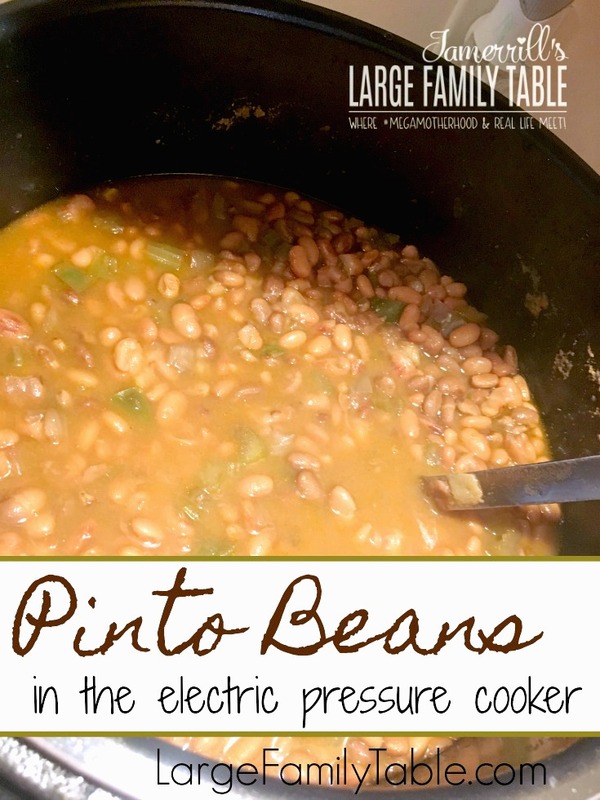 And don’t miss my newest love, here’s my Amazon Affiliate link for the 14 Quart Go Wise Electric Pressure Cooker. This electric pressure cooking beast has been everything I hoped for in my large family cooking world – yes and amen! 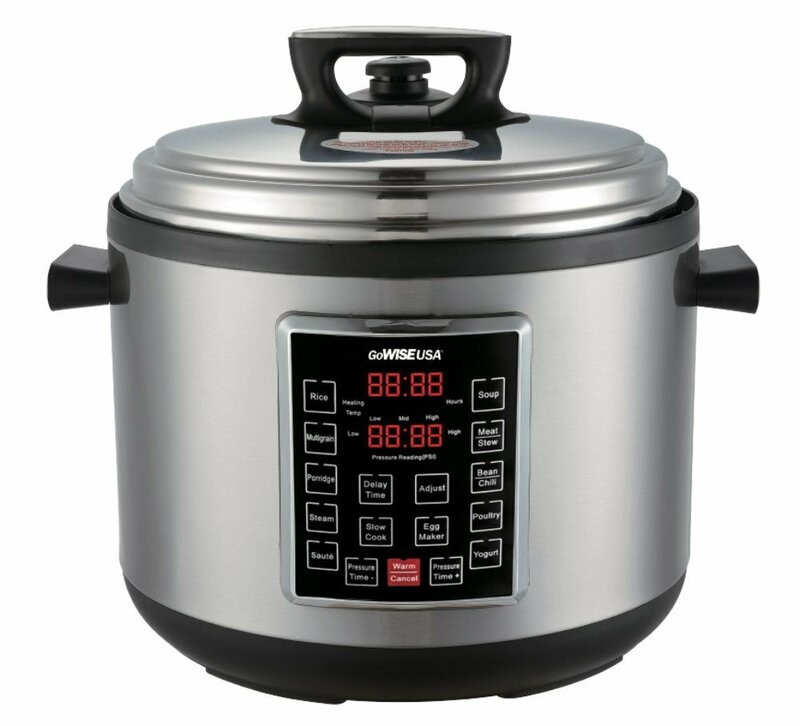 And there has certainly been nothing wrong with also having this great 8 Quart Instant Pot in my large family cooking collection. 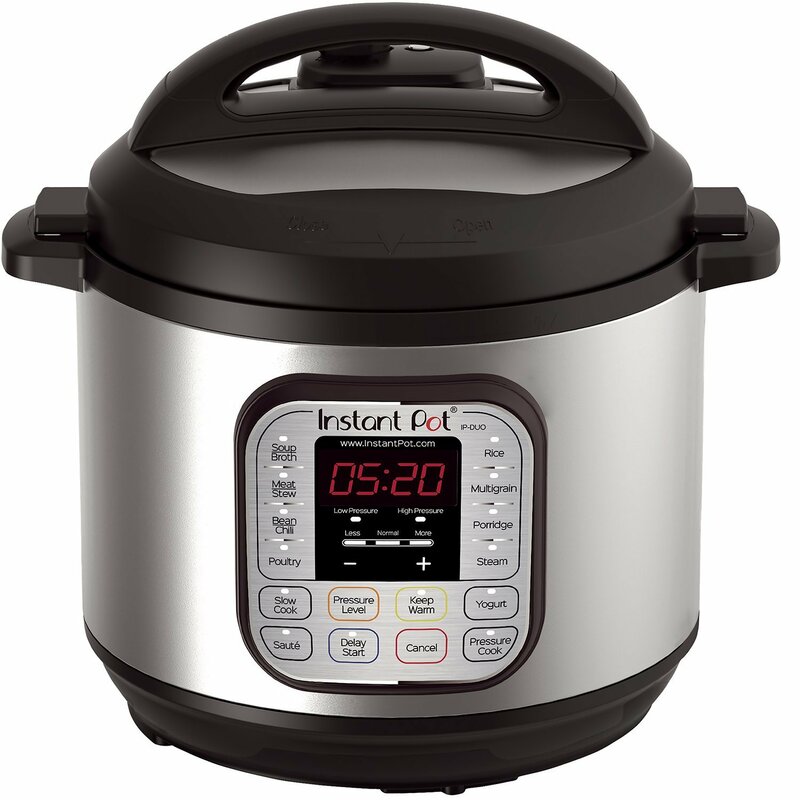 Here’s my Amazon affiliate link to see the exact 8 Quart Instant Pot I bought well over a year ago. Click here to watch the full LARGE FAMILY COOKING ? 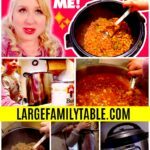 | Large Family Weekend Chili | Cook With Me! vlog on YouTube! For extra fun on this large family cooking day, I additionally cooked up two large pepperoni pizzas. In the middle of making this big stock pot of chili, I remembered I had set pizza dough out of the freezer the day before (ever do stuff like that?). I was kicking myself thinking the homemade pizza dough would be wasted since I was in the middle of doing so much cooking for the weekend. Then I remembered *pizza* and the fact that if I just went ahead and baked the two pizzas surely someone in the house could take it upon themselves to help eat up said pizza. And I was right, it turned out to not be a problem. 🙂 Here’s the recipe for homemade pizza dough if you’re also interested. 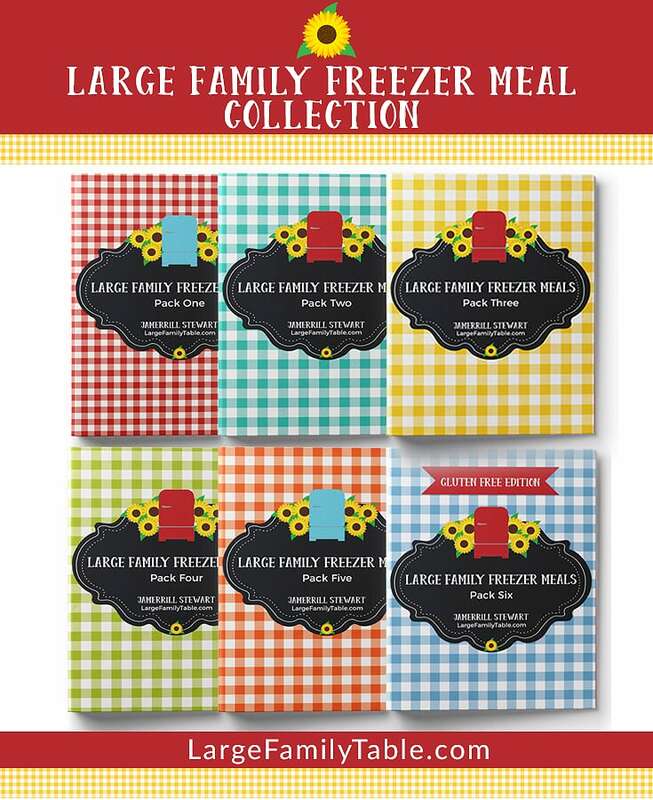 If you’re interested in more large family cooking check out these recipes for large families! Pizza is never a “problem” for families our size. Hahaha!! !